"Children's books joined the crusade against the prevailing 'pride and affectation in dress,' and little girls in particular were regaled with alarming examples to prove that 'prettiness is an injury to a young lady, if her behaviour is not pretty likewise'" (Kiefer, American Children Through Their Books 1700-1835, p. 94). In 1827 a curious little book was published in New York. The anonymously written The American Toilet - a title that refers to the rituals of daily grooming and dressing, and the items used to do so - was one of the many early books for children issued to instruct them on the path to adulthood and righteousness. The book's emblematic illustrations were accompanied by moral precepts. It is one amongst the genre known as "conduct books" for children. At this stage in their development all children's books were didactic in nature, and while great for the parents were dry and deadly to the children compelled read them. Fun was not a part of these books; fun, indeed, was frowned upon and not part of a child's education. Childhood as we now understand it did not exist. In those days childhood was adulthood with baby teeth. Modesty, humility, cheerfulness, mildness, truth, contentment, good humor, innocence, compassionate tears, moderation, industry, perseverance, benevolence, fidelity, meekness, charity, circumspection, discretion, piety, and regularity. These are the virtues that young girls in eighteenth and nineteenth century America were expected to cultivate. They are the virtues that many in modern America believe have gone into the toilet and down the drain. They are the virtues taught in The American Toilet. Conspicuously absent are the dubious modern virtues of gettin' jiggy and workin' your twerk. The book illustrates various toilet articles, each accompanied by a couplet. 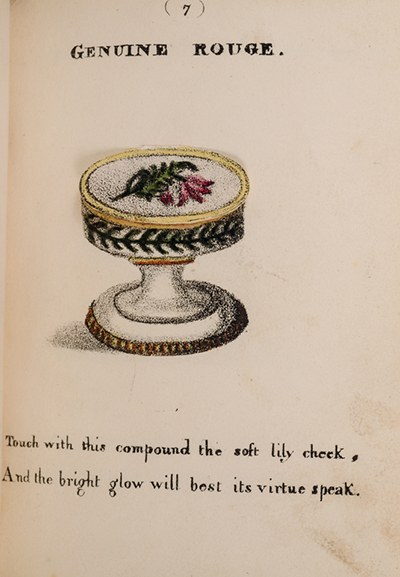 "Touch with this compound the soft lily cheek / And the bright glow will best its virtue speak," reads the verse for Genuine Rouge. The lesson is bared when a hinged flap on the illustration is raised to expose the virtue. "Genuine rouge" is revealed to be not a cosmetic but modesty. Book collectors familiar with the genre will recognize the format as a movable or transformation book, and an early one, the simplest then imagined, produced, and published, a "flap-book." It is quite possibly the first produced in America. This added a novel and fun aspect to learning virtues, noticeably absent from other conduct books. Of further interest to collectors is that The American Toilet is amongst the earliest color-plate books published in America to employ lithographs original to the United States, here hand-colored. Lithography was developed in Europe and during the early nineteenth century all printers skilled in the process were British, French, or German. With few exceptions all early American color-plate books were reprints or piracies of British editions; there were simply no native-born American printers with the necessary skill set at this early point in the century. The plates/stones were imported; the books printed in the U.S. The lithographs in The American Toilet were, in contrast, made in New York by one of the few printer-publishers in the U.S. with the technical know-how to produce them, Imbert's Lithographic Office, a pioneer firm. "Anthony Imbert, originally a French naval officer, learned lithography while a prisoner of war in England. He arrived in New York about 1825 and immediately undertook a series of illustrations for a Memoir published to celebrate the completion of the Erie Canal. His other work includes a series of New York views, portraits, and cartoons. He is last listed in the New York city directory in 1835, and he died sometime before 1838, when his widow Mary is listed selling boys' clothing on Canal Street" (Connecticut Historical Society Museum and Library). 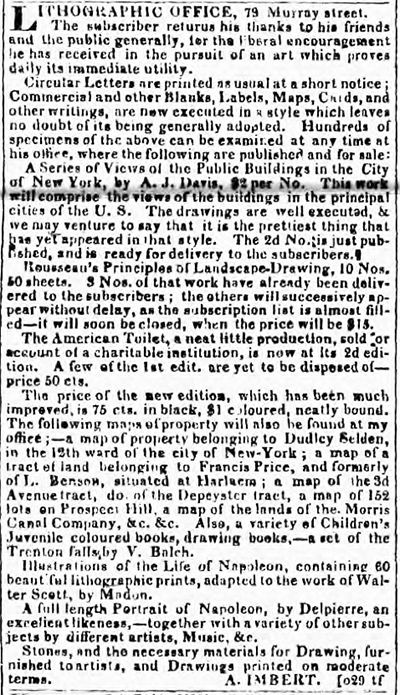 Advertisement for Imbert in NY American For The Country, January, 1827. 1st edition are yet to be disposed of - price 50 cts." improved, is 75 cts. in black, $1 colored, neatly bound." The concept of The American Toilet was not original to the U.S. The book was based upon a flap-book published in London in 1821. "Small gift books were already popular in England during the 1820s, and the lithographer, Imbert, blatantly pirated a British work to produce his American Toilet. 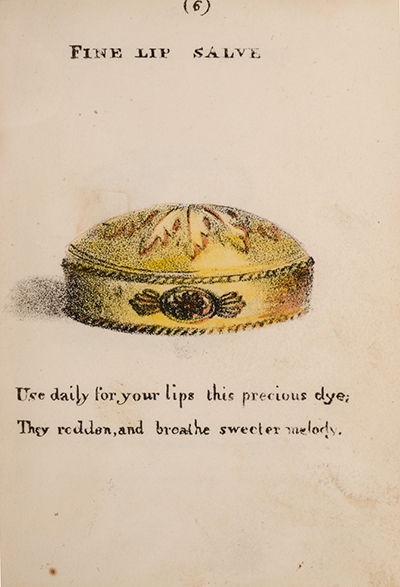 In this delicate little work, the illustrations of various cosmetic canisters have hinged flaps of paper which can be raised to see the 'true' beautifier. 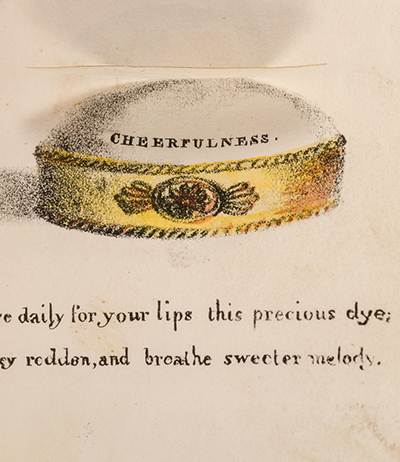 Thus 'A Wash to Smooth Away Wrinkles' is revealed to be 'laughter,' 'Genuine Rouge' to be 'modesty,' and so forth" (Reese, Nineteenth Century American Color-Plate Books). Contrary to Reese, The American Toilet was not a piracy. 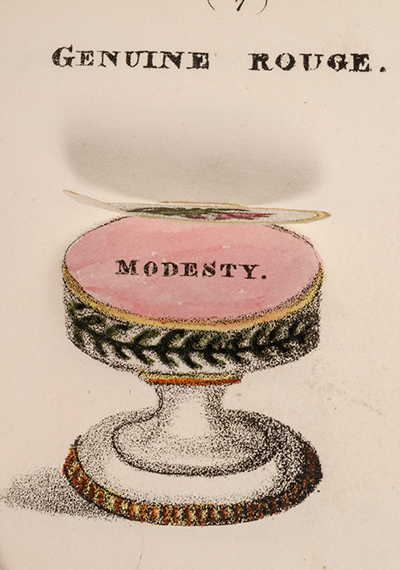 It was, rather, inspired by The Toilet, which was anonymously written by Stacey Grimaldi, illustrated by his father, miniature painter William Grimaldi, and published in London by N. Hailes and R. Jennings in 1821. I recently had both volumes pass through my hands; the concept is similar, the execution different, the Grimaldi version with thirty-two pages of text and only nine plates with flaps, the captions not couplets but, rather, extended verses. The American Toilet contains nineteen plates (plus title-page) and no accompanying text. Its illustrations and couplets are completely original. "Although derivative from Stacey Grimaldi's The Toilet, first published in London in 1821, the American book was the work of the sisters Hannah Lindley Murray and Mary Murray. Neither of them is credited n the book itself, which as copyrighted by George Tracy, and the nature and extent of their involvement in its production is unclear. A second, 'improved' edition was also issued in 1827 for seventy-five cents a copy (the first cost fifty cents), and copies of each were available colored or uncolored. The publication of a second edition indicates some success, and the work was undoubtedly bought as a novelty, since it is probably the first American book to contain transformation plates. It began something of a tradition…" (John Carbonell, Prints and Printmakers of New York State: 1825-1940, edited by David Tatham, p. 24). Who were the Murray sisters? "Hannah Lindley Murray (1777-1836), translator, born in New York City…Her father was a native of Pennsylvania, who settled in New York before the Revolution and was a successful merchant of that city for more than fifty years. The daughter'was an accomplished linguist, and with her sister, Mary, translated Tasso's 'Jerusalem Delivered,' the "Fall of Phaeton' from Ovid, a 'History of Hungary' from the French of M. de Sacy, Massillon's 'Discourses,' and a variety of operas from different languages. She also painted, wrote verses and hymns, and, aided by her sister, composed a poem in eight books on the 'Restoration of the Jews.' None of her writings were published until after her death, when a few of her miscellanies were included in a 'Memoir' by Reverend Gardiner Spring, D. D. (New York,1849)" (Appleton's Encyclopedia). 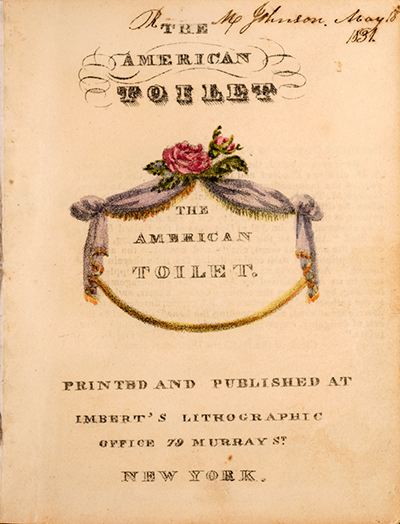 The first edition of The American Toilet was, apparently, published in 1825. There are five copies in institutional holdings worldwide, all in the U.S. It is scarcely, if ever, seen in commerce. The volume under notice is the second edition, issued without date but, according to the deposit notice verso to the title-page, published on January 11, 1827. It appears that the Murray sisters began the project by producing hand-made copies of the book that they sold to raise money for charity groups. They and their book, it seems, came to the attention of Imbert, who printed it based upon the Murrays' homemade version. The British version was reprinted more than once. So was The American Toilet. Imbert published a third edition in 1832, and editions, presumably piracies, were published by Kellogg in Hartford, CT in 1841 and 1842 under the title The Young Ladies Toilet. 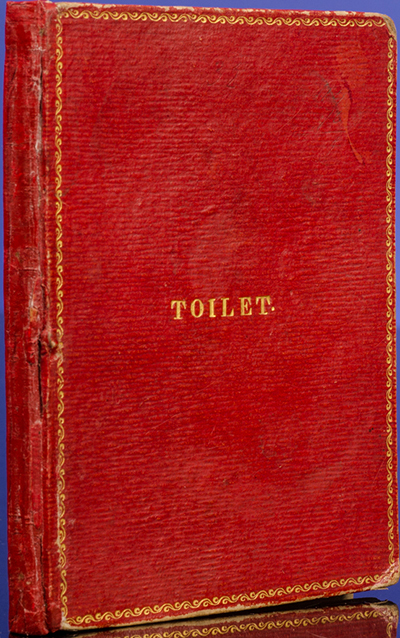 In 1867 another edition was issued, in Washington D.C. by Ballantyne, under the title, The Toilet. There was a crudely produced piracy of The American Toilet published in Charleston, N.C. during the 1830s. "A garish and inferior version on a much larger scale is My Lady's Casket, published in Boston in 1835 [i.e. Lee and Shepard, 1885]" (Muir) with forty-eight recto-only leaves and new illustrations by Eleanor Talbot. The 1827 Imbert edition is typically found with damaged or missing flaps. Percy Muir, in English Children's Books, discusses the original 1821 version under the rubric, "Toilet Books," a sub-species of conduct books. If you've been waiting for the toilet-training joke, sorry to disappoint. However flush the possibilities, modesty, discretion, circumspection, meekness, and, in all things, regularity preclude further comment. [MURRAY, Hannah Lindley and Mary]. The American Toilet. New York: Printed and Published at Imbert's Lithographic Office, n.d. [January 11, 1827]. Second edition. Twentyfourmo (4 5/8 x 3 5/8 in; 118 x 85 mm). Hand-colored lithographed title page with deposit notice to verso, and nineteen hand-colored lithographed plates with hinged flaps; a total of twenty hand-colored lithographs. Original full straight-grained morocco, rebacked at an early date, with gilt-rolled border and gilt lettering. Not in Bennett. Gumuchian, Les Livres De L'Enfance du XVe au XIXe Siecle 334. Rosenbach, Early American Children's Books 683. Reese 51.